Kickstart your child’s productivity for the day; your kids should make their bed everyday. How does your child start his or her day? Watching TV, on their device, or doing something productive? 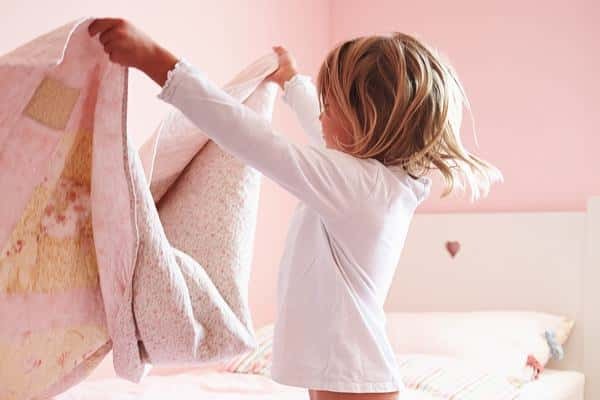 If kids make their beds every morning, they will have accomplished the first job of the day, which unleashes a chain reaction of other habits throughout their day. It gives kids a sense of pride and reinforces the fact that it’s the little things in life that matter. And if by chance they’ve had a bad day, they’ll come home to a bed that they made. And a made bed encourages them to believe tomorrow will be a better day. So if you think they are too young to make a bed – kids should start by arranging their doonas and pillows from around three or four years of age and build from there – then substitute bed-making with preparing breakfast (and tidying plates away), tidying bedroom (properly), or packing their bags (neatly) for the day. Start the day with at least one productive activity rather than a range of sedentary activities to set your kids up for a productive time ahead. NB: For more parenting tips and tricks, be sure to check out my Parenting Ideas website. Michael Grose is the current Channel 9 Today Show parenting commentator, reaching parents Australia-wide on a regular basis.He is also the author of 8 parenting books, including his latest release Thriving! and the best-selling Why First Borns Rule the World and Last Borns Want to Change It. A popular presenter, Michael Grose speaks to parents, teachers and principals on a regular basis.Michael comes from an education background, and has conducted post-graduate research into what makes healthy families tick.He's given over 1500 parenting presentations, including the first parenting seminar in Parliament House, Canberra.Michael is married with three adult children who have all successfully flown the parent nest. Michael Grose is the current Channel 9 Today Show parenting commentator, reaching parents Australia-wide on a regular basis. He is also the author of 8 parenting books, including his latest release Thriving! and the best-selling Why First Borns Rule the World and Last Borns Want to Change It. A popular presenter, Michael Grose speaks to parents, teachers and principals on a regular basis. Michael comes from an education background, and has conducted post-graduate research into what makes healthy families tick. He's given over 1500 parenting presentations, including the first parenting seminar in Parliament House, Canberra. Michael is married with three adult children who have all successfully flown the parent nest.